Popular sporting activities such as tennis and many team sports require the athlete to repeatedly perform bouts of near-maximum to maximum efforts, interspersed with periods of recovery. These intense efforts are generally referred to as “sprints” and typically last <10 seconds. Recovery periods are usually brief, lasting <60 seconds. The ability to repeatedly sprint with little recovery is a component of fitness that requires it’s own definition, assessment procedures, and training strategy. Intermittent sprint exercise is different from RSE as it allows for full to near-full recovery between bouts of sprinting <10 seconds.1 Near to full recovery may take 60-300 seconds. Maximum aerobic capacity plays a role in RSA but it does not seem to be strongly correlated.9 There seems to be a stronger relationship between other markers of aerobic fitness such as velocity at lactate threshold (vLT) and, to a lesser extent, velocity at VO₂ Max (vVO₂ Max).6 This is important to know in order to help structure training. * For a general background on VO₂ Max and lactate threshold please click on the links. While these articles are in reference to running, much of the information can be generalized to racquet and team sports. There are a number of ways to test RSA. Established tests for certain sports such as soccer (e.g. the Bangsbo Soccer Sprint Test) exist, but testing can be customized as the athlete/coach sees fit. Testing Procedure Adapted from Pyne et al. Warm-up for 10 minutes performing low-intensity running dynamic and static stretches as well as 30-meter acceleration efforts. Ensure the warm-up is the same each time the athlete is tested. This is a sample test procedure. Factors such as distance of sprints and rest intervals can be manipulated. 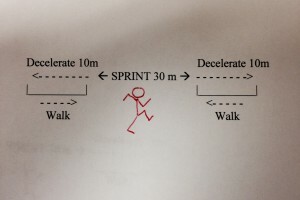 The following calculation provides the athlete with data on how sprint speed decreases over subsequent sprinting efforts. It provides the athlete with a measure of their RSA. This can be used as a test-retest tool to determine the effectiveness of training or used to compare with other athletes. What types of training may be valuable to the athlete who wishes to improve repeat sprint ability? 3 sets of 4-second sprints, with 20 seconds of recovery between sprints. Recovery between sets would be 4.5 minutes. Lactate Threshold Training- Training at or above the lactate threshold may be beneficial as there is a relationship between vLT and RSA. For the athlete involved in team sports, small-sided games may help as this often requires the athlete to perform at or above the lactate threshold. Repeated sprint ability is an important component of many racquet and team sports. Although there is not abundant evidence on the best ways to train RSA, it can be assessed and improved. 1.Girard, Olivier, Alberto Mendez-Villanueva, and David Bishop. “Repeated-Sprint Ability—Part I.” Sports medicine 41.8 (2011): 673-694. 2. Wragg, C. B., N. S. Maxwell, and J. H. Doust. “Evaluation of the reliability and validity of a soccer-specific field test of repeated sprint ability.” European Journal of Applied Physiology 83.1 (2000): 77-83. 5. Pyne, David B., et al. “Relationships between repeated sprint testing, speed, and endurance.” The Journal of Strength & Conditioning Research 22.5 (2008): 1633-1637. 6. Glaister, Mark, et al.“The reliability and validity of fatigue measures during multiple-sprint work: an issue revisited.” The Journal of Strength & Conditioning Research 22.5 (2008): 1597-1601. 7. da Silva, Juliano F., Luiz GA Guglielmo, and David Bishop. “Relationship between different measures of aerobic fitness and repeated-sprint ability in elite soccer players.” The Journal of Strength & Conditioning Research 24.8 (2010): 2115-2121.6. 8.Hill-Haas, S., et al. “Effects of rest interval during high-repetition resistance training on strength, aerobic fitness, and repeated-sprint ability.” Journal of sports sciences 25.6 (2007): 619-628. 9.Aziz, A. R., M. Chia, and K. C. Teh. “The relationship between maximal oxygen uptake and repeated sprint performance indices in field hockey and soccer players.” The Journal of sports medicine and physical fitness 40.3 (2000): 195-200. 10.Hill-Haas, S., et al. “Effects of rest interval during high-repetition resistance training on strength, aerobic fitness, and repeated-sprint ability Journal of sports sciences 25.6 (2007):619-628.